We at eBags are self-proclaimed #wanderlovers, and love nothing more than a new adventure. So it’s with *massive* excitement that we announce eBags Escapes, a new partnership with the Globus family of brands. They are one of the world’s largest tour operators, and the parent brand of the award-winning international river cruise operator, Avalon Waterways. Throughout the year, we’ll curate a series of amazing adventures from the Globus family of brands to share with eBags customers at exclusive discounts only available to our community of travelers! Without further ado, here’s the 411 on our first escape: The Romantic Rhine River Cruise. Explore one of Europe’s most legendary waterways on this mesmerizing 7-night journey along the Rhine. Enjoy guided sightseeing in Strasbourg, Koblenz, and Cologne, as well as excursions to the Black Forest and Heidelberg, Germany’s oldest university town. You’ll sail through the dramatic Rhine Gorge, visit the Gutenberg Museum in Mainz and enjoy a canal cruise through unforgettable Amsterdam. You’ll cruise in style aboard Avalon’s innovative Suite Ships®, featuring, the Panorama SuiteSM, some of the largest staterooms in river cruising. These staterooms are 30% percent larger than the industry standard and feature a bed that faces a wall-to-wall, floor-to-ceiling window, giving you a bed with a view for the sweetest visions ever. And once you leave your room, you will find that same attention to detail everywhere on board. You’ll also find fewer people. Which means more space everywhere you go. Bigger Views. More space. More comfort. Intrigued? Check out the daily itinerary below—then book via eBags to save up to 10% on this trip! After touching down in Switzerland, home of the Matterhorn and the majestic Alps, you’ll transfer by motorcoach to Basel to meet your crew at an evening welcome reception, where you can “Proscht” to the start of an unforgettable experience! Located at the foot of Kaiserstuhl Mountain on the French-German border, Breisach is the gateway to Germany’s Black Forest region, an area of unrivaled natural beauty—as well as the birthplace of Black Forest ham, Black Forest Cake, and you guessed it…cuckoo clocks! You may opt to visit the workshop of a local woodcarver who produces clocks and other carvings or go to the open-air Vogtsbauernhof Museum. On the border of France and Germany, Strasbourg is a charming blend of both countries’ cultures. Your walking tour covers the Gothic Cathedral with its stained-glass windows and astronomical clock, as well as the magical La Petite France district, home to half-timbered houses, quaint shops, inviting bistros, and a waterfront promenade. Optional afternoon excursions into the Alsace wine country are available for wine lovers who aspire to become connoisseurs…or for those who want to escape to the countryside for an afternoon tasting. This morning’s excursion is to Heidelberg, where you tour the ruins of Heidelberg Castle and see the Great Vat, the “World’s Largest Wine Barrel”—which holds 58,000 gallons of wine and has a dance floor on top. In the afternoon you’ll arrive in Mainz, Germany’s largest and most important wine market. Gutenberg, the father of modern printing, was born here; you’ll tour the Gutenberg Museum as well. This morning, you’ll dock in pretty Rüdesheim, a typical Rhine Valley wine town and home to Siegfried’s Mechanical Musical Instrument Museum. Downstream is the dramatic Rhine Gorge, where ancient castles stand sentry on lofty cliffs rising 400 feet from the waterline. You’ll arrive at the Deutsches Eck (German Corner) and join your Local Guide for a walking tour of beautiful 2,000-year-old Koblenz. One of Germany’s largest cities and capital of the Rhineland, Cologne straddles both sides of the Rhine and is known for its soaring, twin-steepled gothic cathedral. Choose between an included Guided City Walk or Jewish Heritage Walk. The Old Town abounds with cafés, shops, and taverns. Be sure to try a Kölsch pale lager, locally brewed in Cologne for over a hundred years! Holland’s sophisticated, modern capital has a rich and fascinating history 700 years in the making. There is no better way to see Amsterdam than by canal boat, cruising through the elegant grachten lined with stately homes dating back to Amsterdam’s Golden Age. You’ll have free time on your last full day to enjoy the city or perhaps join an optional excursion. Your vacation ends with a lovely breakfast in Amsterdam, after which you are free to continue your adventure or (gasp!) go home until your next bout of #wanderlove hits you! Book your eBags Escape now to save up to 10% on select river cruises! There are Romantic Rhine departures throughout the year, both northbound (from Zurich) and southbound (from Amsterdam). For a more detailed itinerary and 2017 tour dates, click here. Book now to save up to $2,000 per couple on select 2017 Avalon Waterways River Cruises—plus, an additional 10% savings on select river cruises, just for being an eBags customer! With an average of nearly 30 kids per classroom and ever-shrinking supply budgets, America’s public school teachers struggle to foster student imagination when they don’t even have the essential BASICS like notebooks and pencils. As one local Denver teacher puts it, these students’ worlds are incredibly small — often stretching no further than their homes, their schools, and the local 7-11. 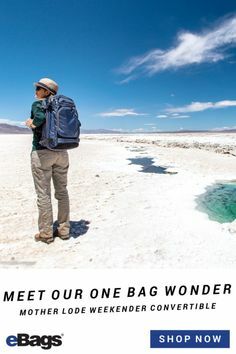 As a leading school backpack retailer — not to mention passionate global evangelists for the educational aspects of travel — eBags holds this issue close to our hearts. So this year, we decided to take action. Through the innovative non-profit organization DonorsChoose.org, we’re thrilled to be able to donate $1 for every school backpack purchased during our busy school backpack season. Founded in 2000 by a public high school teacher in New York, DonorsChoose.org helps teachers in under-funded school districts bridge the gap between their students and the wider world. How? By making it easy for anyone to fund classroom projects in public schools throughout the country. Donors can contribute in increments as small as $1 to any project that piques their interest — whether they’re passionate about the subject matter, or feel connected to a school in their hometown. To date, the organization has raised more than $400M nationwide, impacting more than 18M students in nearly 70,000 schools. Denver’s McGlone Elementary, a historically low-performing school that had declining enrollment and high teacher turnover, credits DonorsChoose.org with helping them turn their institution around. Not only do they rely on their donors for basic supplies, they have also used it to launch a new Google Expeditions program — enabling inner-city kids to travel the world using disposable virtual reality goggles. McGlone’s groundbreaking Google Expeditions program has enabled Moore and his team to transform his students’ smartphones into virtual reality goggles that allow them to experience a level of experiential learning that would otherwise not be possible. We’re pleased to note that a portion of our donation this season will go toward expanding this program — taking more kids to more places than ever before. Once labeled a “turnaround school” by the Denver Public School system, today McGlone enjoys the highest literacy growth in the state of Colorado. Principal Sarah Goodall counts the school’s DonorsChoose.org programs as part of the reason for its dramatic shift…and eBags couldn’t agree more. Do your Back-to-School shopping with eBags, and help us make a difference for America’s public schools! Shop school backpacks now — your DonorsChoose.org donation will be made at checkout! One of the ultimate pleasures of travel is getting to taste the local cuisine and treat your taste buds to exquisite new flavors and sensations. There is a foodie lurking in all of us, and one of the best ways to visualize how something might taste is through photography. Enter Foodspotting, our favorite app for taking your culinary experience to new levels. What is the first question you ask in a restaurant? “What are the five best dishes?” Foodspotting specializes in helping you find the best dishes at the best restaurants through creating a platform for travelers to share photos of their favorite foods with others. So instead of reviewing restaurants like many of the other foodie apps, Foodspotting focuses on being the platform where people can share great dishes. You can find great dishes by searching your favorite restaurants and seeing what is recommended, or by searching for a dish you are craving, and seeing where you can find it. The name says it all. “Foodspotting” is all about spotting, sharing and celebrating the foods you love. The app doesn’t seek to provide a platform for negative reviews…in fact, you can’t leave one. People take shots of dishes they love, and you can say “loved it,” but there is no room for negativity in this app! The back-to-school season is in full swing. August just officially knocked on our doors and we let it in! This means parents only have a few short weeks left of summer before school starts again. Every year is an opportunity for a student to get a new backpack. It’s sort of like a rite of passage for kids as they march through elementary to middle to high school, and finally to college! It helps define them, protect them, and most of all, it serves as a symbol for growth! For parents, it’s just another item to check off your list before the next year begins. Today, parents have more to think about than the color or price of a backpack. Ergonomics experts encourage parents to consider how a backpack will affect your child’s back, and to select one that fits. After all, almost 14,000 children are treated for backpack-related injuries each year! You don’t want to be THAT parent! Ok, so what’s a parent to do? Backpack shopping doesn’t have to be brain science. It can be very easy if you follow our advice. We’ve distilled our pointers into 6 easy tips that will make backpack shopping a breeze…might we say, even a pleasure? Backpacks are not puppies. You don’t need to touch or feel them before you buy them. So don’t put yourself through the hassle of battling traffic, other parents, lines, and shrinking selections, when you can just buy a backpack online. We can’t stress the importance of reading user reviews, and these can normally only be found online. So do your research, find out what packs work for you, and jump online to buy (yes, you can do it in your nightgown). Shopping online means you can compare prices on different sites to make sure you get the best deal. We encourage you to shop around on ALL back-to-school purchases, and certainly on your backpacks. However, we’ve made it pretty easy on you. If you find a backpack anywhere else that is more expensive than on eBags, we will give you a 110% price guarantee on that pack. This means we will pay you 10% of the difference in the price between two bags. So go ahead and try to find a lower-priced backpack. We’ll pay you if you do! Stores are pulling out the stops to win your business over the back-to-school season, so regardless of what you are buying, look for the best deals. eBags is one of the only sites that offers a huge variety of backpacks from many different brands, so we take back-to-school season seriously. This year, we are offering 20% off all backpacks, plus 5% back in eBags Rewards. This is like getting 5% of your purchase back in CASH to use on your next purchase. If you’re a savvy parent who likes to shop for limited-time offers, check out our Extreme Deals and get up to 80% off your next backpack. It’s a lot. We know. But we want to help you find your PERFECT backpack at a price that will make you proud to be a parent! Do the research and select a correctly sized pack for your kid, even if it takes more time. It is worth it to have the confidence that your kid is not going to be negatively impacted by their backpack. The general rule is that the height of the bag should extend from about two inches below the shoulder blades to the waist level or slightly above. Our Jansport Superbreak is one of our Top 10 Iconic Backpacks and Jansport’s #1 seller! Get the JanSport SuperBreak Backpack! For maximum protection for your kid, we suggest looking for a padded back and shoulder straps, as well as a sternum and hip belt. 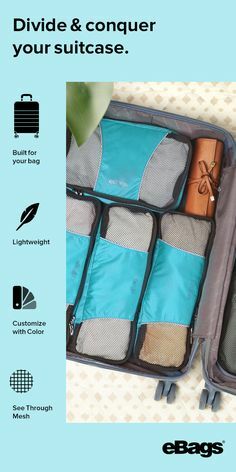 These accessories will help evenly distribute the weight of a heavy bag filled with books and will take strain off sensitive neck and shoulder muscles. The North Face Surge has molded shoulder straps, a padded mesh back panel with a spine channel and a wicking lumbar panel for maximum support and ventilation. It also boasts a sternum strap with whistle buckle and a removable waist belt. 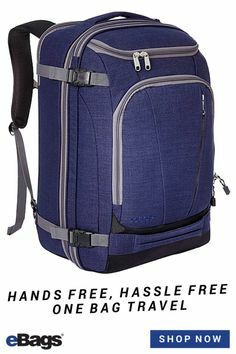 Get The North Face Surge Laptop Backpack! 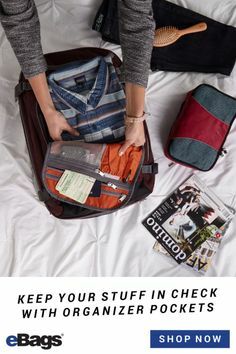 Instead of grabbing that first cute backpack you see on a shelf, take the time to seek out a specialty backpack retailer (like eBags) and compare different brands, styles, features/functionality, colors/patterns, and price points. We just launched the eBags Backpack Finder, which helps parents locate the best backpack depending on what types of features and functionality are most important to you. We said it once, but we’ll say it again…trust what other parents have to say about their backpack purchases. It pays to spend some time reading user reviews to learn more about a particular backpack. You can learn so much from what parents say, and even the best backpack in the world may not be a good fit for you because of something another parent reminds you to think about. 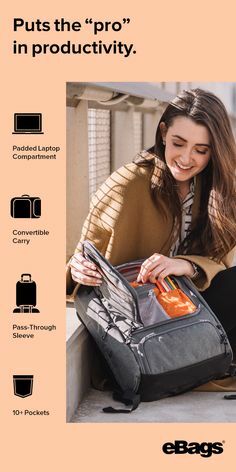 Start by checking out eBags Top 10 Iconic Backpacks, which are our top picks for the 2016 year, based on the highest reviews, recommendations, and rankings of millions of parents who shop on eBags.com. 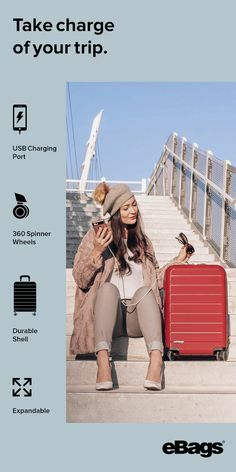 eBags best-selling backpack is the SwissGear Travel Gear ScanSmart Backpack 1900. It ‘s exclusive to our platform and comes in five awesome color combinations! 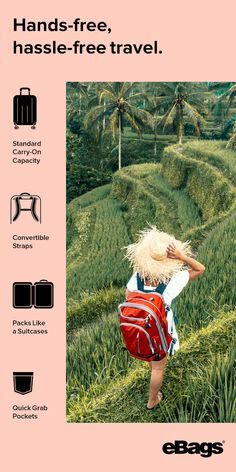 Get the SwissGear Travel Gear ScanSmart Backpack! The Olympics Opening Ceremony starts on August 5th and there are tons of options to stay involved with this spectacular international event. Rio is just one hour ahead of Eastern Time Zone, and Rio 2016 will be the most live Olympics ever. Here are tons of opportunities to catch the events in real-time wherever you are. There are lots of apps and we’ve reviewed them all. Our top selection is the NBC Olympics App, which will give you access to everything: Olympic athlete profiles (with the ability to enable location services to view stories and highlights for your local athletes), latest news, full competition schedules, real-time results, medal standings, and more. NBC will be streaming 6,755 hours of programming PER DAY for the Olympics! You can link directly to the NBC Sports app for live stream coverage and set up alerts when a specific event is going live. Toilet Finder – Lots of people, not a lot of toilets in Rio. Find the nearest one! Rio 2016 Social Hub – Connect with the Olympians on social! Tripadvisor – What to do, where to stay, where to eat…in Rio. Apontador – Best local app to find local dives, bars, banks, hospitals, etc. Learning new languages doesn’t come easily to 99% of the population. But when you travel, it’s not only respectful to attempt to communicate in the local language, but it can also make the difference between having a great travel experience versus being frustrated or lost the entire time! We’ve looked at all of the major translation apps, and Google Translate is still our favorite. It will translate anything you write, speak, draw, or shoot on your camera…into 103 languages (and growing). It’s hands down the most comprehensive translation app. on the market with the greatest breadth of languages. That being said, it isn’t perfect. Occasionally you will experience an inaccurate translation, particularly with a longer sentence translating into a lesser-supported language. But overall, this is the perfect language companion that will help you bridge the language gap wherever you travel. Plus, it’s free! Google Translate allows you to use your camera to take photos of menus, signs, or even handwritten notes. You simply take the photo, use the “tap to translate” feature to translate it into your selected language, and “voila!” (that’s French for BOOM!) your image is translated. TIP: Download the offline application if you will be traveling without access to WIFI. It works remarkably well. The long, warm summer days are the perfect excuse for an adventurous road trip. But the burden of planning what to do and where to stop along the way sometimes outweighs the adventure itself! Enter Roadtrippers, the app that does all of the planning so you can focus on the doing. Simply plug your itinerary into the app and it automatically recommends the best places to stop along the way – including restaurants, coffee shops, breweries, national parks, historical sites, scenic points, quirky roadsides stops, family museums, rest areas and more. 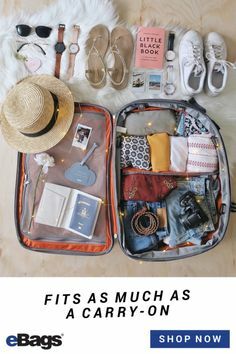 The app also has hundreds of suggested itineraries all across North America, including road trips through National Parks, coast to coast itineraries, Pacific Coast Highway, The Appalachian Trail road trip, border to border trips and more. The website and mobile apps are free. One of the biggest costs of any road trip is the cost of fuel. The Roadtrippers route planner also provides estimates on how much you can expect to pay in gas from one point to the next, or for your entire itinerary.